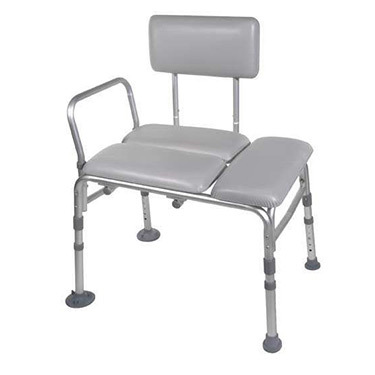 Featuring a comfortable cushioned seat and sturdy backrest, this lightweight aluminum transfer bench by Drive Medical is both comfortable and versatile. With unique Dual Column extension legs, you can adjust the height in 1/2" increments and the seat back adjusts without tools. The bench comes with a new A frame design composed of 1" aluminum that is light, sturdy and corrosion resistant. Extra suction cups provide additional stability and tool-free assembly will make your life even easier. Please note: The bench back and legs are reversible, but the handle is not. Helpful for safe access to the bathtub. Sturdy and comfortable chair works for those with limited mobility. Pros:Nice padding and surprisingly stable. Cons:Shower curtain has to go on the outside of the tub, which results in some water on the floor. The product came quickly, the product quality was excellent and easy assembly. The price was good and the company was prompt on getting the unit out. The catallac of all benches! Bench was described by my son, who is using it, as the "catallac" (spelling???) of all benches! Pros:Easy to assemble, easy to clean, comfortable.